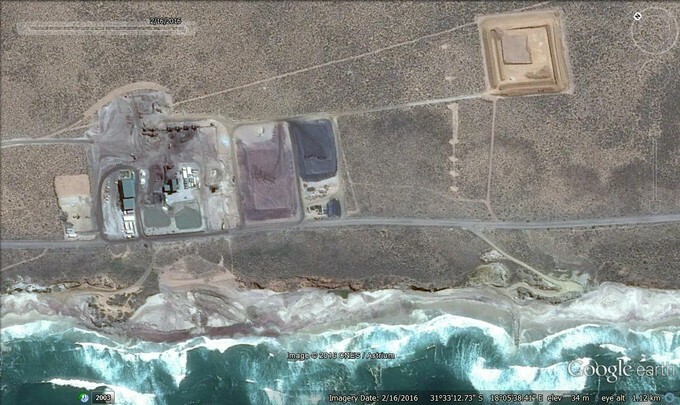 The controversial Australian mining company Mineral Resources Commodities (MRC) has launched a court case against the national Department of Environmental Affairs (DEA) arising from the department’s raid on the company’s Tormin Mine, situated 350 kilometers north of Cape Town. A spokesperson for the company Anne Dunn, confirmed that MRC was taking legal action. The raid in late September had been expected after numerous complaints to mining and environmental authorities about alleged illegal actions by the mine in the coastal zone. These include the construction of structures on the beach zone, mining in prohibited zones and questions about a massive collapse of the sea cliffs below the mine processing plant. This cliff partially collapsed apparently as a consequence of activity at the Tormin mine on the West Coast. These actions fall under the the National Environmental Management Act and specifically the Integrated Coastal Management Act (ICMA). They also appear to be in conflict with Tormin’s mine licence conditions managed under the Mineral Petroleum Resources Development Act. This was the second recent blow for MRC. The company announced its withdrawal from the rich Xolobeni mineral sands project on the Wild Coast in July this year after divisions in the community peaked with the murder of anti-mining leader Sikhosiphi “Bazooka” Rhadebe in March. Tormin’s mining practice has been in the spotlight since the mine began operations in March 2014. The following month the Department of Mineral Resources issued the mine with instructions to rectify several changes it had made to its mining practices which deviated significantly from the original environmental authorisation provisions of the mining licence. These beaches are famous for their pink sands, tinted by high proportions of garnet, a super-hard and therefore commercially useful mineral. Other minerals – zircon, ilmenite, rutile and leucoxene – were further treasures hidden within the pink sands. These minerals collectively make up almost half of the beach by volume, a veritable bonanza. Tormin declared a profit of $12.9 million on a turnover of $48 million in 2015, its first full year of operation. From the outset Tormin only had environmental clearance to extract around 5% of the minerals, specifically the zircon and rutile. This would have had only limited environmental impact. 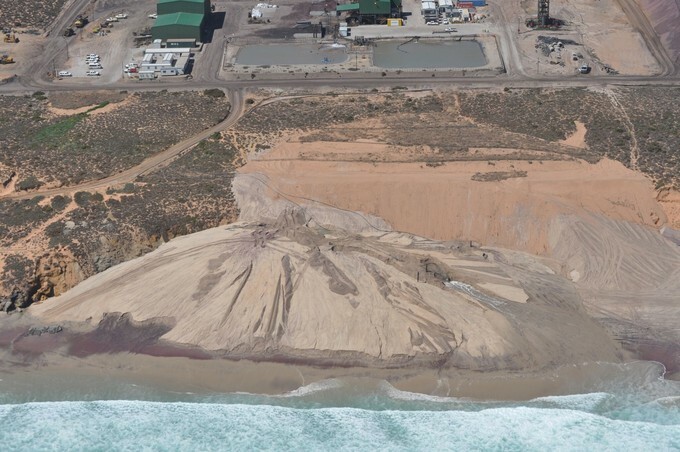 However the mine unilaterally began to extract the full range of minerals from the sand, a move that placed the environment of the mine at serious risk through extraction of half of the beach sand by volume. These beaches are backed by steep, unstable sea cliffs. Consequently all mining – and any other activity at all – was forbidden in a buffer zone that extended 10 metres from the foot of the cliffs seaward. However this has apparently been ignored from the outset, with details of mining recorded in aerial photographs and Google Earth images. Because the entire mine is directly on the beach, it falls within what is defined by ICMA as the coastal protection zone. This includes an area up to a kilometre from the shoreline. ICMA provides substantial statutory protection to this important ecological zone, hence the exclusion zone. ICMA is administered by the DEA. It is also important to note that when Tormin gained permission to mine the beach, mining was jointly governed by both DEA and DMR. DEA dealt with environmental governance and DMR with mining. However in December 2014 this changed into what is known as the “one environmental system” where DMR assumed all responsibilities for mine management, including the environment. This is central to the legal challenge Tormin has launched against DEA’s raid on the mine. DMR appears to have insufficient capacity, knowledge, or will to enforce good environmental governance. This has been evident at Tormin. In March 2015 DMR questionably granted Tormin permission to expand the processing area, which also falls in the coastal zone. 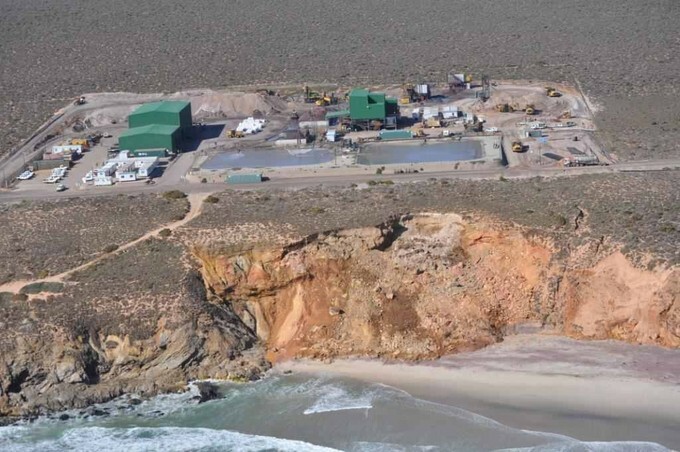 The department also permitted a radical change in mining methodology that involved trucking all the beach sand to the processing zone on the cliffs above the beach. This was originally to have been pumped in a concentrated slurry from the beach. 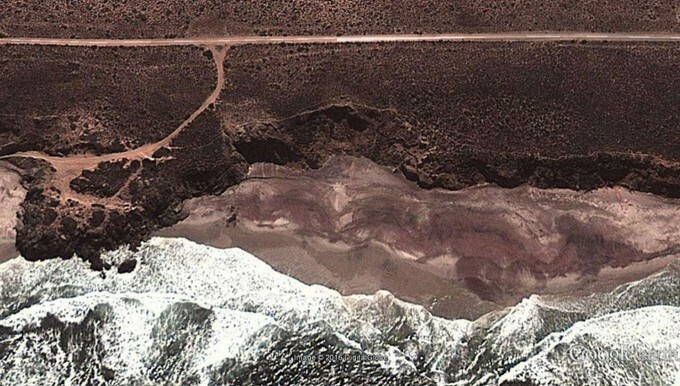 Worse yet, in April 2015 the Western Cape director of DMR granted permission for further plant expansion and for the illegal groyne – a structure running from the beach out to sea – that Tormin had built on the beach, from within the exclusion zone well into the surf zone. This kind of activity is prohibited under ICMA and requires extensive environmental research. The provincial DEA informed DMR that its permission was irregular and could not be countenanced. DMR failed to take further action. Various independent parties repeatedly informed both DMR and DEA of their concerns about these contraventions, to no avail. 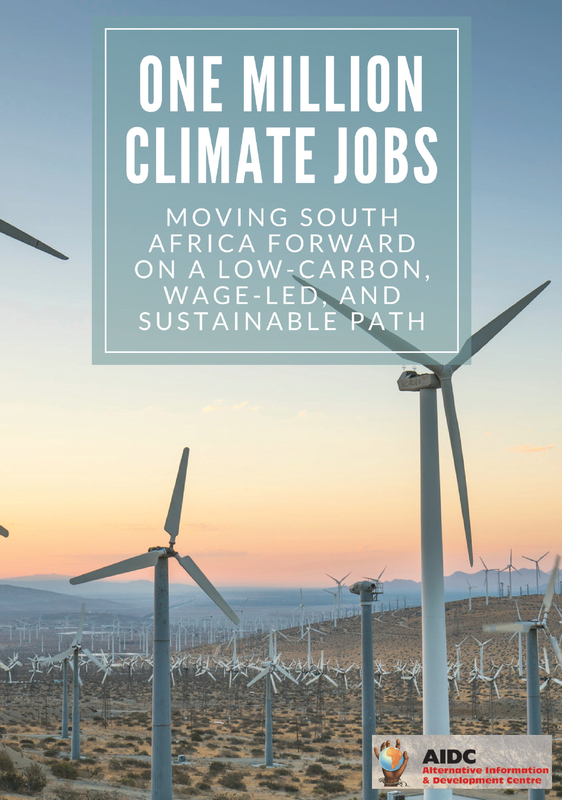 In November 2015, the Centre for Environmental Rights wrote a letter to the Western Cape office of DEA, setting out that department’s obligations in terms of ICMA and its statutory obligation to take action against the alleged transgressions by Tormin. In May 2016 DEA responded that it took the matter seriously and was investigating, in consultation with DMR. Action was finally taken in the raid this month, almost a year after the letter to DEA. 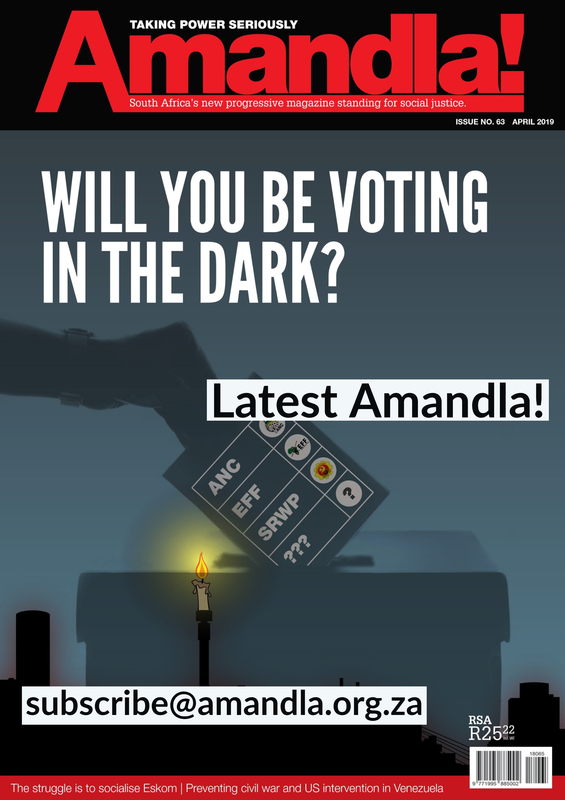 The raid involved representatives from national and provincial DEA, The South African Police Services, The Department of Rural Development and Land Reform and the local Matzikama Municipality. DEA spokesperson Albi Modise told GroundUp that the raid formed part of a criminal investigation process. The legality of the raid has subsequently been challenged by Tormin via its holding company Mineral Sands Resources. However the DEA was, at the time of writing, not aware of any legal challenge to the raid. Several questions arise. First, if everything was above-board at Tormin why would the company be reluctant to allow inspection of its operations? Tormin has established a record of discouraging and preventing inspections by various parties, including DEA and the municipality. The latter’s officials have been forbidden by elected councillors to inspect the mine, an illegal action under the Municipal Systems Act. Tormin has claimed that inspections disrupt operations, a hollow excuse. Secondly, if there were no problems, why is Tormin challenging the legality of the raid in what appears to be a direct attempt to stonewall the investigation? Contacted by GroundUp, Tormin and its director, Mark Caruso, declined to comment further on the matter. A report in News24 by Matthew le Cordeur quoted Caruso as saying he felt the warrant was illegal as the mine was regulated by DMR not DEA. He went on to claim that Tormin was legally compliant with mining and environmental legislation. These claims appear trite. If everything was above-board, Caruso should have no concerns. It is telling that he apparently wishes to retreat to the protection of DMR, given that department’s apparently limited grasp of its environmental responsibilities and its bizarre prior rulings. What consequences may Tormin face? Firstly, it could be in breach of its mining licence by mining in the exclusion zone. It could be forced, under section 24 of the National Environmental Management Act, to rectify this and to address the construction of the rock groyne. 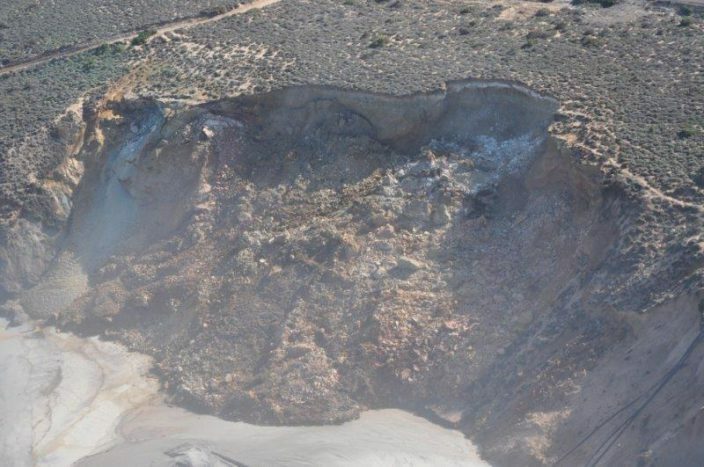 It could be ordered to properly repair the collapsed cliff. 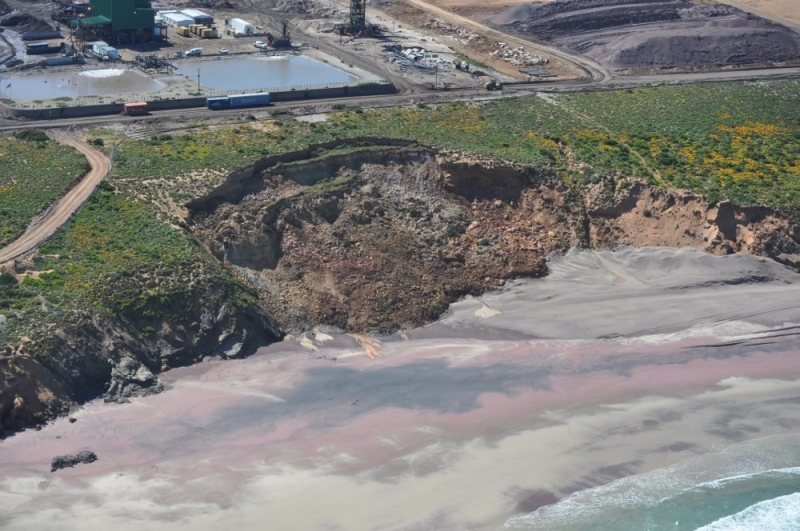 It could be instructed to address the changes to mining methodology and put proper measures in place to prevent further erosion of the beach and cliffs. Work at the mine could be halted until this is done. If the DEA raid found sufficient evidence – apparently computers and documents were removed from the mine – that these actions were knowingly undertaken, management could be held liable and criminal action could be instituted. Ignorance of the law is no excuse; it is the duty of the mine owners to be fully informed and adhere to all relevant legislation. The result could involve substantial damages, a revision of the operating licence of the mine, withdrawal of the licence entirely or even the expulsion of the company from the country. After years of civil society oversight, the authorities have finally taken action and are investigating some serious concerns with Tormin’s management practices. Australian mining companies have evoked mixed response in Africa. Some are exemplary, participatory and transparent. Others feel they can do as they wish without consequence. Judgement remains open in Tormin’s case. They must pack up an leave. They have transgressed – fix what has been damaged and revoke there licence. THEY SHOULD NEVER HAVE BEEN PERMITTED TO DO THIS IN THE FIRST PLACE.